For some of us, the bathroom is the most relaxing place in the entire house – a place we can use to take care of our physical selves as well as organize our cluttered thoughts. 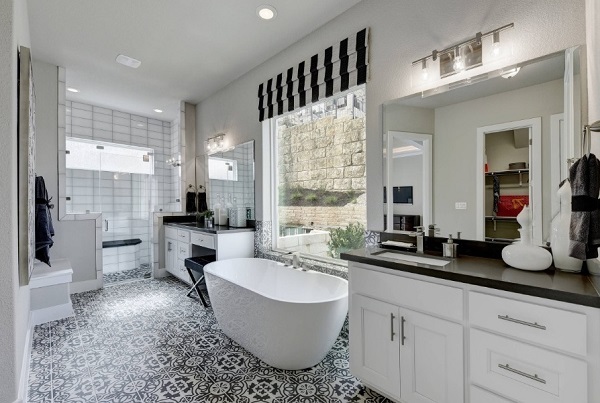 If you already have a white bathroom and are looking for some ways to amp up its glam quotient, here are some of the coolest white bathroom design ideas for you. Marble has always been the most obvious choice for white bathrooms, and with good reason. Choose a white set of drawers with a marble countertop to match your marble floors. Custom vanity fittings are also welcome, especially if they have a marble finish. This way, you will get to have an all-white, extremely classy bathroom without burning a hole in your pocket. Order and symmetry should be the call of the day when you’re trying to decorate your master bathroom. Having said that, there are a lot of ways in which you can combine symmetry with the colour white. A majestic chest of drawers adds depth to the room, while also providing you with an immense amount of space for all your storage needs. To create some contrast and break the monotony of the room, you can add textured countertops, tub surrounds, and windowpanes. If you want a bathroom in light colours, but not exactly the colour white, then pastel shades should be your saving grace. Pastel shades like beige and cream create a beautiful colour palette without making it too drab and monotonous. Accentuate the cream and beige with soft pastel shades of green and blue to get a subtle but classy appeal. Add soft furniture, like a vintage vanity with an upholstered ottoman for the best effect. Contrast can play a very important role in making the whites of your bathroom pop. Consider using dark shades like black and brown for your cabinets, and then couple it with light coloured countertops, light wallpapers, and light textured tiles. This way, the colour palettes will never overpower each other, but will instead create a harmonious balance between the two. You can also use textured wallpaper if you have large windows in your bathroom, as the natural lighting will accentuate the patterns without making too obvious an effect. If you want your bathroom to look fresh and out of the box, consider using a combination of different white tiles. To create a contrast effect, paint one of the walls in a rich brown or burnt orange colour, and position a beige or stark white vanity against it. This combination, along with the white tiles on the other walls of the bathroom, will create a nice effect, adding warmth to the tone as well. You can also choose to colour coordinate your toiletries with the overall colour scheme of your bathroom and make it stand out even more. With these tips, you can figure out the best ways to make your white bathroom look the finest it can. After all, a well-decorated bathroom does not only house all your essentials but can also make a good impression on the minds of your guests.